Update: Multiple sources have confirmed to Billboard that Guns N’ Roses will indeed reunite at 2016’s Coachella, possibly to be followed by a stadium tour. Now, more than 20 years later, the band’s website and Facebook page may contain clues hinting at a potential reunion. If you look closely, you can see that the band’s website was recently updated with their old logo, two silver revolvers wrapped with red roses. And if that’s not enough writing on the wall for you, check out their Facebook page: Their new profile photo is a live crowd. Need more evidence? Reports indicate that a ~mysterious~ trailer containing crowd shots soundtracked by Guns N’ Roses hits has played during several showings of Star Wars: The Force Awakens. 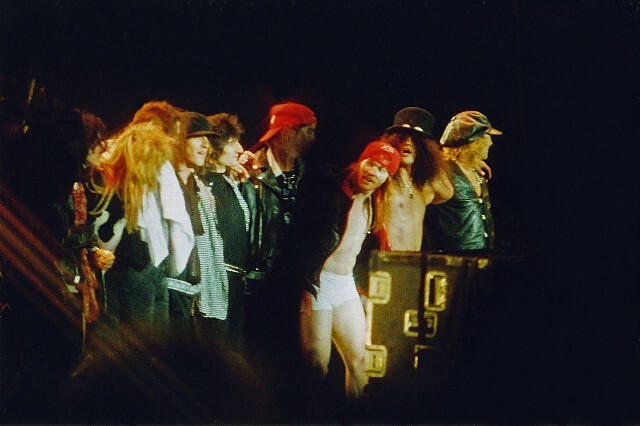 Adding fuel to the fire, 99 Scenes reports that the Canadian festival Rockfest had been in talks with said reunited band to headline next year’s iteration, for which Guns N’ Roses allegedly asked (translated from French) “for four times the amount the festival had paid System of a Down” when they headlined in 2015. According to rumors, SOAD was paid $2 million for the gig, so that’d put Guns’ ask at — if the numbers add up — $8 million, which Rockfest organizers politely passed on. Also, it’s 2015, nostalgia is currency, and sooner or later everything you and/or your parents loved will be revived… and then mercilessly killed. Dial up that amp and take us to Paradise City… we guess.